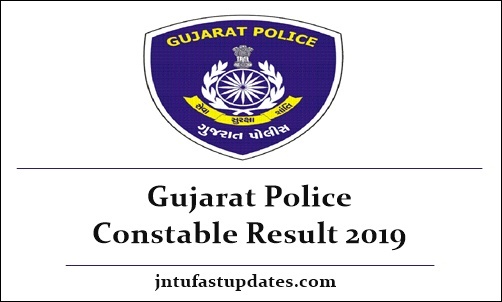 Gujarat Police Constable Result 2019: Gujarat Lokrakshak Recruitment Board conducted the police constable written test on 6th January 2019 in various places across the Gujarat state. Hopefuls who have applied for the police constable posts in Gujarat have competed for the written test round as per their allotted slot. As per the reports by the Gujarat Police department, almost all the competitors have appeared for the constable written test in the state of Gujarat. The department has released the answer key on 8th January for the conducted examination. All the hopefuls who are not yet checked the answer keys can check now by visiting the Gujarat police department official website, police.gujarat.gov.in. Or the answer key will be accessible to download on lrbgujarat2018.in or ojas.gujarat.gov.in. The competitors can visit any of these portals to check the Gujarat Police constable result in 2019 as well. Along with the result, the department will announce the cutoff marks and merit list. Candidates can soon expect the Gujarat Police constable result, cutoff marks 2019. Stay checking the official websites for more updates. Gujarat Lokrakshak Recruitment Board/Gujarat Constable Bharti has recently rolled out a recruitment notification for 6189 Group 3 posts. Many of the hopefuls dream to get police constable jobs in Gujarat state have applied for the announced posts. Candidates interested in Gujarat Police jobs have applied for the Constable posts during the application dates. The department is going to shortlist the suitable aspirants through the written test, physical eligibility test, physical measurements test, medical examination, interview round and document verification rounds. Candidates have to qualify in all the rounds to get shortlisted for the announced posts. All the candidates competed for the police constable examination on 6th January can expect the result in last week of January or first week of February [tentatively]. Aspirants waiting to check the results can stay checking the Gujarat Police Department website, police.gujarat.gov.in. The organization will soon announce the result date on its portal. Candidates competed for the Gujarat Police Constable examination can expect the result in the month of February (approximately). Hence the hopefuls competed for the examination can stay checking the official website on a regular basis to check the result date. Candidates have to score the required cutoff marks/qualifying marks in the exam to clear the written test round. As per the Gujarat Police Department, aspirants need to get 40% of marks in the examination to clear the written test round. On the homepage “Gujarat Police Constable Result 2019” Link appears on the screen. hello sir my name is jaheda shaikh mene lrb ki exam di hai jisme mere marks 53 aaye the correct marks but mujhe 35.5 marks mile hai jismese nagative marks 12.75 cut kiye hai but mere marks 53-13= 41 positive hai please reply what i do???? ?